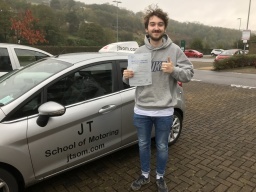 John Thomas is the driving school owner and along DVSA approved instructors provides the 1-1 tuition on a very personalised basis. Lisa takes care of customer services and that is who you are most likely to speak to when making an inquiry. Lisa is very experienced at matching your requests with the appropriate instructor to ensure your lesson are successful. Customer reviews are our lifeblood like most local businesses and there are many on the pages of this website for you to read through to see if we are a good match for your requirements.. Choosing a driving school and ensuring you receive the maximum value for your hard earned money can be extremely daunting and reading local reviews from students in your area can help with your decision. John is very keen to accommodate your requests and will offer a full money back guarantee unless you are completely satisfied with the service and tuition you receive, you can find full details on our website. Testimonials are curated by JT School of Motoring and are not independently reviewed or verified. 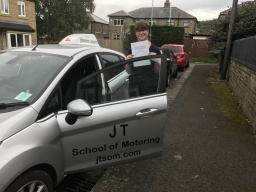 "Pass First Time like Will"
"I chose JT School of Motoring because a family member had passed with them a while ago. Additionally, their pupil reviews were excellent. I had never sat behind the wheel of a car before, so I found it a little nerve wracking. However, my Driving Instructor Keith Garlick quickly got me to start feeling confident as his teaching methods were second to none. I would have no hesitation in recommending JT School of Motoring to anyone. Keith was very friendly and honest and made the whole process easier than I expected. Overall, I was very happy with the customer service and the whole experience. I can't think of any way it could be improved." "I chose JT School of Motoring because their pupil reviews were excellent, also family member had passed with them a while ago. I had never driven before, and was very nervous about the prospect of controlling a car on my own. But my Driving Instructor, John Thomas, quickly put me at ease. His teaching methods were very good, and I enjoyed my lessons so much more than I had expected. I didn't feel rushed, and felt that I received a thorough training. That's probably why I passed first time! I tried to think of something that could be done to improve the teaching or customer services, but couldn't think of anything."